The germination of democracy in the Republic of Guinea has been a pipedream for its tenacious and resilient 10 million people. Historically, Guinea has lacked transparency or accessibility to the international community. Its people are oppressed and poverty-stricken, despite its huge natural wealth, which includes bauxite, alumina, gold, diamond and agricultural products. It remains impoverished despite being endowed with natural resources that could potentially make it one of the wealthiest countries in Africa. Fortunately, new development in this West African nation could be charting a course in the right direction. Recently, Guinea endured a convulsion of grief over violence and outrageous human rights abuses, including rapes of scores of women and the massacre of nearly 150 patriots, mostly from the opposition side. These people had demonstrated, exercising the fundamental freedom of speech that a functional democracy offers. The power-thirsty military leader Captain Moussa Dadis Camara had suddenly announced that he would postpone elections and declared himself a candidate for the projected elections, which caused a reaction that resulted in large-scale, unprecedented violence and brutality. The country is not alone in the region when it comes to violence. Guinea offered sanctuary to about 500,000 refugees from Sierra Leone and Liberia when they went through the rebel wars of insurrection. Eventually, some refugees have made Guinea their adopted home. These three neighbors are parties to the Manor River Union, an economic consortium that promotes trade and migration issues among its members. But the porous borders are vulnerable in the event of war or unrest in any member nation. The Liberian civil war eventually spilled over to Sierra Leone, while Sierra Leone's civil war displaced thousands of refugees to Guinea and Liberia. Guinea still accommodates refugees from its neighbors, but Guinean soldiers can be as ruthless as they are corrupt. After Guinea's independence from France in 1958, its premiere leader Ahmed Sekou Toure ruled his people with a dictator's iron fist. He eliminated his critics using torture at a notorious prison, until his death. Lansana Conte, a military official, then seized and held on to power until his death. Conte's death left a power vacuum, which Camara quickly captured. In this politically backward and precarious nation, scrambles for power have been the norm. At the height of Guinea's turmoil and the extreme scrutiny it received from the international community, Camara was shot in the head at close range by one of his junta men. He argued that Camara refused to take responsibility for the tragic outcome of the savage military operations that helped entrench him in power. He had to be rushed to Morocco for medical attention, with his return pending. Stringent sanctions and pilling pressure from United States and the international community awaited Camara upon his return. Camara was offered sanctuary in Burkina Faso, with the possibility that he may have to face trial at the International Criminal Court for war crimes against humanity, initiated by the United Nations. This defused the tension at home. In a similar case, Liberia's deposed Charles Taylor is currently facing trial at the Special Court for Sierra Leone in The Hague, for war crimes against humanity and his support for Sierra Leonean rebels. Camara's judgment day could be much closer than he thinks. "I'm really genuinely cheered that people are concerned here, that they aren't dropping their guard, assuming it's done," said Patricia N. Molly, U.S. ambassador in Conakry, "because it's not done." Currently, events in Guinea are taking an unexpected turn. 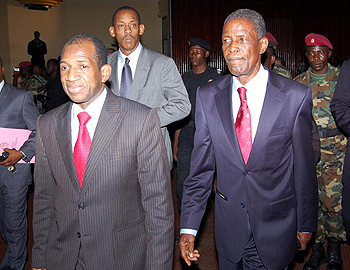 Second-in-command of the junta, General Sékouba Konaté, gingerly supported the election of a new prime minister, Jean-Marie Doré. This fearless opposition leader left the stadium bleeding during the recent bloody massacre. The brutal military remains in the background, nursing the mindset of the red-bereted guards who executed the massacre at the stadium, while the historic, embryonic plant of civilian rule very slowly germinates. When Doré took power, he promised the nation its first free elections this year. He hopes to form a government—with 10 representatives from the former opposition, 10 from the junta and 10 from provincial governments—and oversee preparations for elections. A fierce contest for these positions is underway. Already Doré faces criticisms for being too slow, a week after taking office. "Things have happened so fast," said Sydia Touré, a vocal opposition leader. "This is something we couldn't have imagined two months ago," he said. "It's a new vision." Time will tell if the budding democracy in Guinea can pull West Africa from the darkness of endless conflict. Guinea's scenario could harvest the emergence of civilian rule and the fruits of democracy, as the government now has a chance to tap the vital human and natural resources necessary for development.